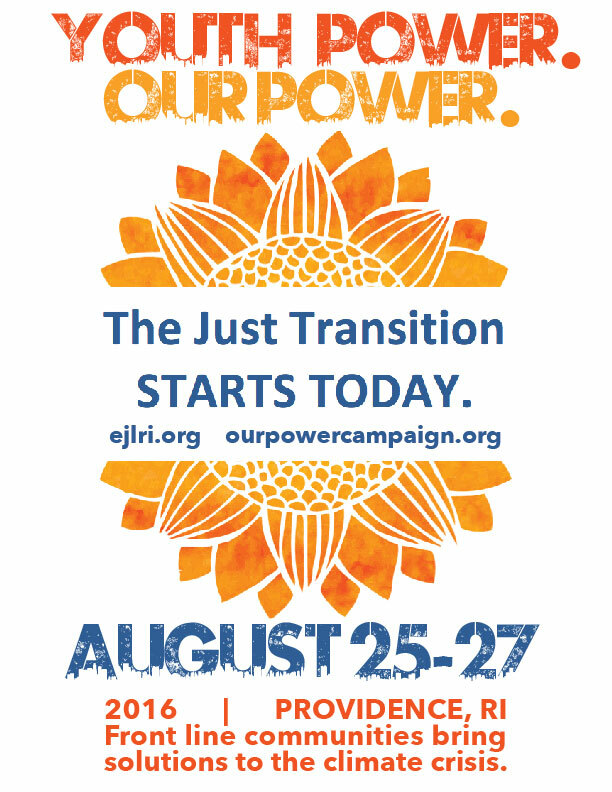 In collaboration with the Environmental Justice League of Rhode Island, we are helping organize a youth-focused Just Transition Assembly in Providence, RI (Location TBA) August 25-27, 2016. There are three dynamics that shape today’s world conditions—the economic crisis, the ecological crisis and the crisis of empire. These dynamics, along with increasing violence in defense of hetero-patriarchy, continue to shape the ground on which we struggle. Meanwhile the most destructive impacts of climate change–such as extreme storms and the disappearance of water sources–are threatening communities worldwide who have the least responsibility for climate change and the least resources to adapt to and survive it. Connected to the economic crisis and the ecological crises, the US continues to wage wars in the name of freedom and democracy as a means to maintain power around the world. We believe that in order to address the root causes of these crises, frontline communities most impacted by environmental racism, institutional and systemic injustice, economic and gender oppression, are the voices we need to listen to and uplift for the solutions that will benefit us all. GGJ members are already on the frontlines of these crises. We understand fully how race, class, and gender play out for our communities when it comes to democracy and power. We know capitalism is at the root cause of the crises we experience, and we know that we need to build the different road– towards an economy that is better for people and the planet, new ways of practicing democracy, being stewards of the Earth’s resources, holding our differences while sharing common values and principles. The process in which we challenge capitalism and create our own solutions and alternatives is through Just Transition. Just Transition is not the final state we want to end up in, rather it is the process for us to begin to envision and practice an anti-capitalist way of living. A Just Transition includes a framework for governance, for how we relate to the Earth, how we produce and consume, for reparations within the US and in the Global South, for how work is defined and valued, and for how people relate to each other. It is a step towards a complete re-imagination of our world, grounded in practice and solutions offered up by communities that have been the most exploited and neglected by capitalism. At the end of the day, we are not talking about a gentler capitalism, we are talking about transforming the way we relate to the world and each other. In the tradition of People’s Movement Assemblies which came out of the US Social Forum process, GGJ members will host a series of regional Just Transition Assemblies between Summer 2015-Fall 2016, which will develop a collective platform for the Next Economy. We envision these assemblies help to build the components, or pillars, of the kind of a racially just and feminist economy we want for the people and the planet. We hope participants will share ideas on what a just transition to a next economy might look like in our communities, how current campaigns and activities connect to this just transition, and what kind of local economies we envision. These assemblies are meant to connect and build on top of each other, in developing best thinking/best practices, creating space for peer-to-peer exchanges, and to understand components of the Climate Justice Alliance’s Our Power Campaign.